Listening for Owls and Nightjars at a ridiculous time of night was a nessesity as couldn’t sleep and couldn’t wait for the day to begin. Distant Grey-crowned Crane’s and a Freckled Nightjar kept the adreniline running until it was time to meet the rest of my team in the centre of Fort Portal. Everybody on time and were off. First stop was the Tooro Botanical Gardens where the staked out Verreaux’s Eagle Owl would perform, usually it is perched high above in the mature Ecalypt plantation staring down with its pink lidded eyes. Unfortunately for my team it had gone fly-about but fortunately the Botanical Garden Team saw it later in the morning. Our time here was not wasted though with Little Rush Warbler and Levailiant’s Cuckoo providing the days only sighting. Next was a brief stop at a Swamp just behind the “ Mountains of the Moon Hotel” , here a small colony of Northern Masked Weavers had taken up residence. 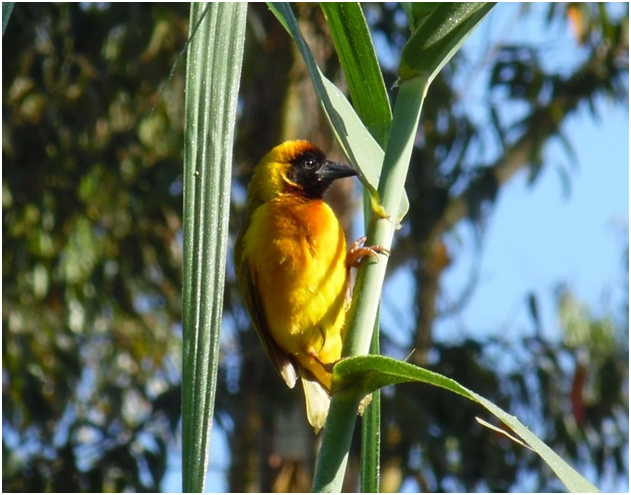 Although not on the Uganda list as yet we are confident that a description recently sent to the East African Rarities Committee will allow acceptance. Also present were lizard Buzzard and a very showy Malachite Kingfisher. Jumping into our vehicles we made the short journey up the Saka road and parked at the University campus. Situated in rolling grassland above the beautiful Lake Saka this must represent the most picturesque learning centre in Uganda but no time for prose we have birds to see. Hunting African Marsh Harrier and Black-shouldered Kite quartered the grassland, while from the stunted shrubs Sooty Chat and Whinchat could be seen, the latter a winter visitor from Europe. Other migrants included hoards of menacing Alpine Swifts gliding swiftly just above our heads while from a leafy Fig tree over the stream outflowing Saka we found a Wood Warbler flitting about with three or four Willow Warbler’s. By now we had walked about an hour and some members were slacking, onwards I said, not far now! Eventually, we reached another small Crater Lake, Kigere. 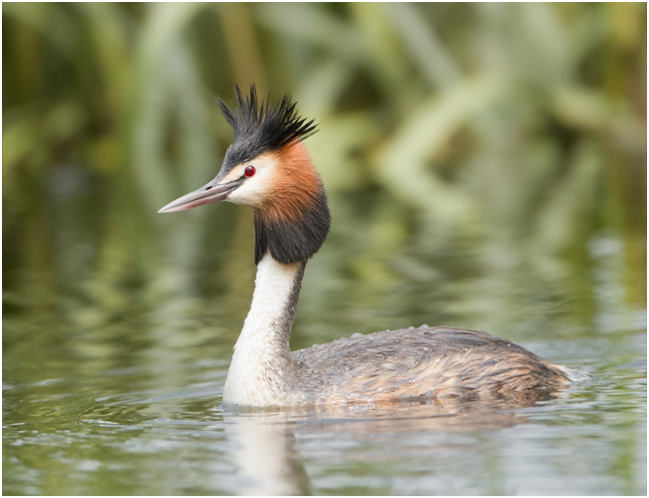 This was my main target and as we rested on a bluff overlooking the lake we could see two family parties of Great-crested Grebe. This is one of the few sites in Uganda, indeed in East Africa that this species can be found and it was vital for BBD that we recorded this species, needless to say this was the only sighting from all the Ugandan teams, well done my team. Also present were small numbers of Red-knobbed Coot and Little Grebe but the hoped for Giant Kingfishers refused to be seen, you cannot see everything. On the way back to the vehicle we were rewarded by a flotilla of overflying Abdims Storks, these inter-African Migrants follow the rains feeding on the newly emerging Grashoppers, while as we ate our lunch back at the car we were entertained by Yellow-throated Longclaw and African Pipit. By now rain clouds had started to accumulate and we beat a hasty retreat, sitting out the rain for an hour. When it stopped it was back into the field and continue with our target. We returned to the Botanical Gardens and in the final hour of daylight found more Willow Warblers and with them an immature Red-backed Shrike, these birds presumably dropped by the rain as they migrated. The latter a new species for the gardens. Our final species recorded was a Brown-backed Scrub-Robin which was singing its heart out, glad that the rains had stopped. While we continued looking for extra species non more deemed to join our list and eventually in the gathering gloom we retired to count up our scores. Our team recorded 142 but with our other teams from Fort Portal which were using different habitats we had amassed a very respectable total of over 220. Quite remarkable when you consider that we recorded hardly any wildfowl or Wading birds and testimony to how rich Uganda is. Well done to all the teams who competed in this annual event and many congratulations to the winning team from QENP.